How many times have you cycled up Tilburstow Hill? Not one of our easiest hills and one that I can’t say that I enjoy. Perhaps that is because whenever I climb this hill I get the vibes. It’s due to my psychic attunement to the paranormal! It all started 2 years ago, when on an autumn club ride we visited the Hare and Hounds for our lunch stop. 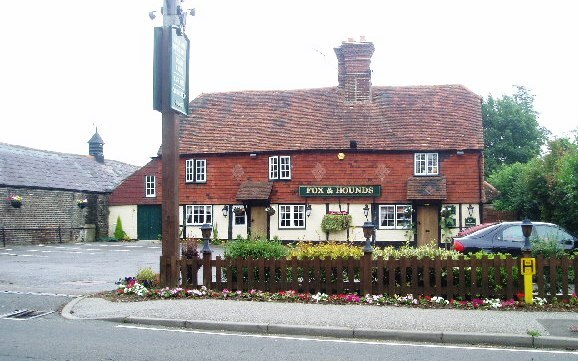 Tilburstow Hill Road dates back to Roman times and the Fox and Hounds has been there since 1601. As you might expect it has a bit of a history, perhaps even a ghost or two. It was on the occasion of this autumn ride that I first got the vibes. Also visiting the Hare and Hounds on that day, were members of the local Hash House Harriers, a social running club. And what could be more sociable than running to a pub for a few Sunday pints! But all these runners were wearing fancy dress. All were dressed as pirates. And it was this that started the vibes and which lead me to find out about the life and death of John Edward Trenchman, a pirate and smuggler. Now this is a rum story, but it’s true! Trenchman grew up in London’s 17th century dockland, among sailing ships and sailors from a hundred foreign lands. Inspired by tales of adventure and the gold of the Spanish Main, aged 12 he ran away to sea, joining the crew of Henry Morgan, the notorious Caribbean pirate. In later years, to avoid another war with Spain, the English Crown pledged to wipe out all pirating by English ships in the Caribbean Sea. So Trenchman then returned to England and set up as a smuggler on the south-east coast. Business proved good and within a year he was bringing teams of pack-horses loaded with contraband up to Croydon every month. A member of Trenchman’s gang was arrested after a fight in an ale house, recognised as a smuggler and sent for trial. However he turned King’s evidence to save his neck from the noose, and gave detailed information of the secret routes used by the smugglers, plus the date of their next journey to Croydon. Customs men, with soldiers, laid an ambush at Tilburstow Hill. When Trenchman and his gang rode into a small clearing in a wood the soldiers immediately opened fire. The fight was short and fierce, with only a fatally wounded Trenchman managing to make his escape through the surrounding dense undergrowth. Bleeding badly he staggered into the ‘Fox and Hounds’ Inn where, in 1687, he died from loss of blood some hours later. The villagers of Godstone took pity on the pirate who had died so far from the sea. They buried him in an unmarked grave at the south end of the churchyard, and it was then that the haunting began. One night shortly after Trenchman’s burial, two grave diggers were hotly pursued through the churchyard of St Nicholas, by a man in seaman’s clothing who had suddenly leapt up from behind a headstone. Other people began to report seeing a shadowy figure dressed in seaman’s clothing lurking among the graves at dusk. 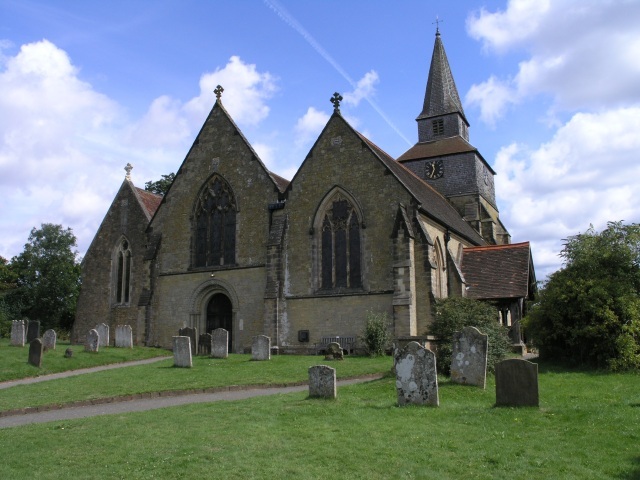 Uncanny, weird, and frightening things began to happen in and around Godstone’s church. Finally the priest and churchwardens removed the pirate’s body and reburied him with a full Christian service, opposite the church doors. 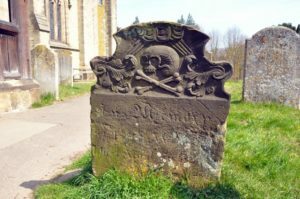 Here you will find a most unusual headstone only a few yards from the church doors of St Nicholas, the Parish Church of Godstone. Carved on it are the notorious skull and crossbones which mark the final resting place of a pirate and smuggler who died of wounds received in the ambush carried out by customs officers in 1687. From then on nothing more was seen or heard of Godstone’s pirate ghost. At last he was at peace. And if you think that I just made this up, take a look at his grave stone. But not after dark! really enjoyed this, keep up the work on local history. Well, let me tell ye all. Having been the landlady of the FOX AND HOUNDS for the last 6 years, I can tell you a few spooky tales and have come face to face with our smuggling friend a fair few times. Table 4 in the restaurant seems to be a hotspot for trickery with glasses sliding across the table, and glasses persistantly jump from shelves behind the bar. Taps turn themselves on and odd items turn up in the most weirdest of places. His grin is marled with mischievousness and his hobnailed footsteps are heavy on the ceiling of the bar. Enter if you dare!!! The Fox and Hounds has become a regular haunt on our winter rides. Julia and Tom have often commented on the cold draught from the front door when we have been sitting in the alcove area. See above and you will now now why. Ellie does not just sell spirits! Since my niece told me about john Trenchman I have been intrigued , I visit his grave when I go to the cemetery once a week and make sure I leave some flowers. I recently went to put a small plaque on his head stone, while I was there I spoke to him about a problem I had, and to my surprise the next day it was solved. ? To much of a coincident , I don’t think so. Fascinating – and explains a lot more than some of the explanations I’ve heard. now, what do you know about the Hell’s Angel who’s buried there and for whom 200 bikers return each year to “Crack a bottle of JD over his grave”?